Heartland Men’s Chorus offered up one of its familiar zany and tender holiday programs in “Packages with Beaus” at Yardley Hall at Johnson County Community College on Sunday. With guest performers Claybourne Elder and the UMKC Graduate String Quartet, as well as the chorus’s soloists and small group performers, Artistic Director Dustin Cates and Heartland Men’s Chorus rolled together a traditional as well as splendidly diverse collection of festive music and music that captured the spirit of the holidays. Opening with an arrangement by James L. Stevens of “Nearer, My God to Thee,” with soloist Michael Schnetzer, the chorus signaled its intention to offer variation on the traditional holiday fare and followed it with the difficult and stunningly beautiful “Festival Gloria” by Craig Courtney, showing the depth of the men’s choral skills. Notable moments in the early part of the program celebrated Hanukah in “One Light” with soloist Max H. Brown, and a performance of “African Noel” with the smaller chamber ensemble performing the charming round. The emotional Jewel piece “Hands,” arranged by Cates for chorus with solo turn from Todd Gregory-Gibbs, was dramatic and emotional in its message of light and hope in times of darkness. The guest performer at the Yardley Hall event was Broadway performer Claybourne Elder, whose singing shone with depth of feeling as well as humor. He offered a powerful performance of Joni Mitchell’s “River,” a song that reflects more of the darker emotions often felt during the holiday season. During the second half of the evening’s performance, Elder returned with a ukulele and a rollicking “I’m Getting’ Nuttin’ for Christmas” and later a “Santa Baby” mock strip-tease. The concert’s second half was thematically lighter, beginning with a comically choreographed “Sleigh Ride” and “I Want to Stare at My Phone with You (A Millennial Holiday Song).” Brandon Shelton’s turn as the long-suffering “Marge” from Human Resources in “A PC Christmas” and the Bob Chilcott arrangement of “The Twelve Days of Christmas” (adapted by Tim Sarsany) drew lots of audience appreciation. The hilarious highlight, however, was “A Cowboy Kislev,” featuring the small chorus group “Burnt Ends” decked out for the Hanukah trail drive—complete with Menorah and yarmulkes under their cowboy hats. Returning to the solemnity of the evening a wordless version of “Stille Nacht,” with the UMKC Graduate String Quartet, was dedicated its performance to members of HMC who have passed on. The inclusivity of the holiday season theme was back with the final powerful number “Put a Little Love in Your Heart,” with a solo by Christopher Kurt. The encore was a dramatic rendering of Leonard Cohen’s “Hallelujah,” delivered as all of the performers left the stage by walking through the house. This concert added variety and perspective to the usual holiday musical fare, giving its dedicated audience a chance to find the season’s spirit in new dimensions of song and experience. 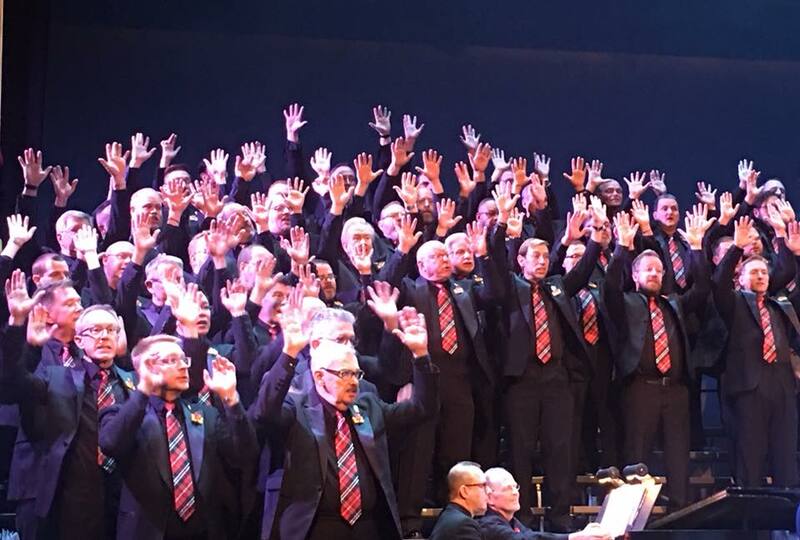 Heartland Men’s Chorus is a local gem, giving fine performances of thoughtful song choices and well-crafted singing that show their versatility as well as their love of performance.